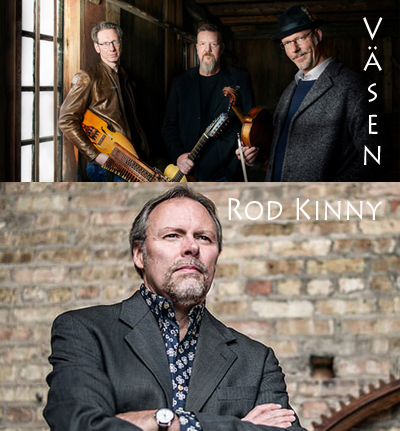 Väsen (Olov Johansson, Mikael Marin, and Roger Tallroth) are acclaimed composers and performers in the living tradition of Swedish folk music.They have a new CD Brewed and are currently touring in the US. A longtime musician, Rod Kinny has always had a passion for his craft. He has just released his 4th CD Forces of Nature on which he shares his ever-growing musicianship and gift for songwriting. Hi, great Väsen interview, thanks a lot. Just a small correction at time 14:50 in the podcast download: the translation of the swedish title “Tröstemarsch” is more like “Consolation March”. I guess “tröst” and “trust” sounds similar, that is why it was wrongly translated to “Thunderstorm”, but if you listen to the music and expect to hear thunderstorm related music then it will be confusing. Sorry, I have to correct myself too: I meant to sayt that “tröst” and “thrust” sounds similar.